of our solar power vendors had a solar powered Level 1 electric vehicle charger on display. 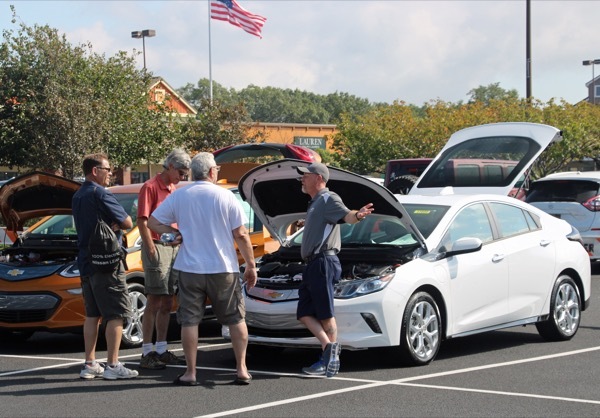 Join us on September 17 at Tanger 1 to see many of the electric and plug-in hybrid electric vehicles currently available in the greater NY market. Talk with enthusiastic vehicle owners to learn why they love their vehicles and/or with dealer representatives to understand the various features of the vehicles. Also find out how easy it is to re-charge vehicles. Attendees will also have an opportunity to ride in or drive one or more of the vehicles on display. There are currently 140 attendees registered. Registered attendees report 381,596 electric miles driven.